By the mid-2000s, it seemed like GM executives had finally figured out a few things. Firstly, that GM’s global divisions were producing some excellent cars that ought to be sold in America: see the Saturn Astra and Pontiac G8. Secondly, that GM no longer had the lion’s share of the American market and not every division needed to have a full lineup. Thirdly, they had learned they were more than capable of differentiating products on a shared platform. Rebadging was becoming less and less common: cars like the Pontiac Solstice and Saturn Sky had vastly different interiors and exteriors, for example. And then they go ahead and signed off on this: the Pontiac G5. A lazy rebadge, the G5 was antithetical to all GM was becoming. To add insult to injury, the G5 didn’t even fit with Pontiac’s role in the changing organization. 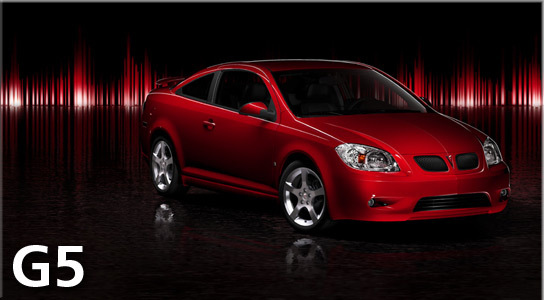 A Chevrolet Cobalt with red gauges and a twin-nostril grille, the 2007 G5 was a mere bone thrown to the dealers that were missing the Sunfire (axed after 2005). Pontiac in Canada had maintained a presence in the compact segment with a rebadged Cobalt known as the Pursuit, so as with the Pontiac Astre in the 1970s, Pontiac USA followed Pontiac Canada’s lead. GM had taken steps to establish Pontiac as a niche performance brand. Bob Lutz had spoken about paring the model lineup down to a core group of sporty models, including the Solstice roadster and G8 sport sedan. But Pontiac often accompanied Buick and GMC models on dealer lots, and as those two brands took steps upmarket, dealerships must have been anxious to keep loss leaders on their lots. The idea of a sporty compact to slot below the G6 sedan/coupe/convertible range wasn’t unwise. What that compact needed to be, though, was something more distinctively Pontiac. Chevrolet had a Cobalt SS with a turbocharged 2.0 Ecotec four-cylinder engine pumping out an impressive 260 hp and 260 ft-lbs. If they had just invested in sheetmetal as differentiated from the Chevy as the previous Sunfire had been and modified the interior somewhat, they could have had an appealing and somewhat distinctive compact. Instead, the G5 arrived with a choice of two naturally-aspirated four-cylinder engines: a 2.2 with 148 hp and 152 ft-lbs and a 2.4 with 173 hp and 163 ft-lbs. Transmissions were a five-speed manual and a four-speed automatic. Although Canada’s Delta Pontiac was available as a sedan, the American G5 came only as a coupe. It was almost insulting that GM would release such a flimsy rebadge and that the most powerful G5 would be considerably less powerful than its Chevy twin. The Cobalt was a competent if not class-leading compact but those solid bones didn’t help the G5. The Chevy outsold the Pontiac by almost 10-to-1, and the latter was well off its predecessor the Sunfire’s volume. The G5 stuck around for three years, dying only because its brand was axed during GM’s bankruptcy proceedings. Sadly, it wasn’t even the most shameful rebadge foisted upon Pontiac at the time. Yeah, the G3 is all that kept the G5 from being the worst (or best?) example of re-badging. It’s kind of sad, but cars like the 3 and 5 make it obvious that GM had very little in the way of long term product planning for many of it’s divisions. It’s also somewhat apparent that when dealers barked, someone in Detroit jumped….whether or not the dealers had a clear vision of what the customer wanted/expected. If it’s any solace, I can’t ever recall seeing a G3 anywhere besides at the auto show. 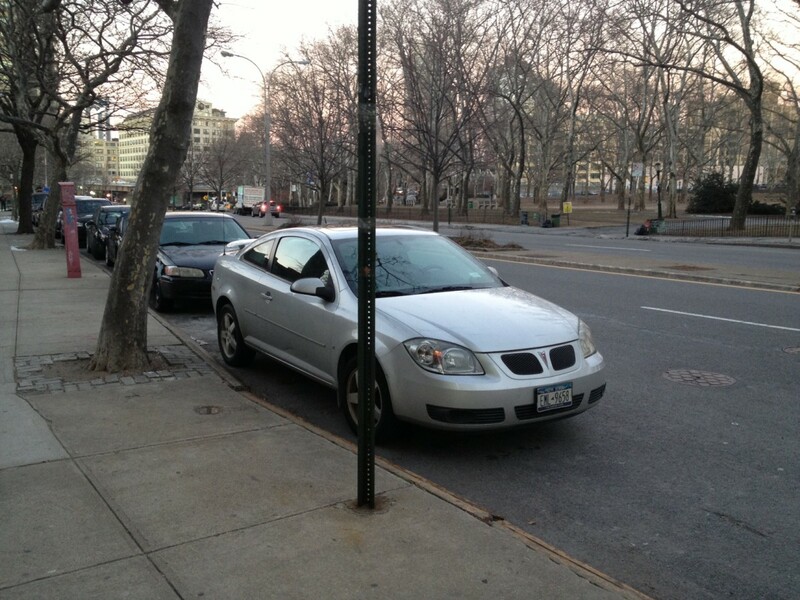 YES the Pontiac G3 is the same Daewoo based version of the Chevy Aveo. The same miserable heap became the hated Holden Barina after two very popular models GMH introduced one that simply didnt sell. In switching their imports from Opel to Daewoo, Holden created a real problem for buyers. Almost any driver could tell the ‘new’ car didn’t feel as good as the ‘old’, creating an impression in the would-be buyer’s mind that small Holdens were crap. After a while, said would-be buyers didn’t even think of Holden for a small car. I see quite a few Cruzes around now though, but that has the image of being Australian-modified. Off the top of my head, I can’t think what other small cars Holden sells any more – they’re that uncommon! God forbid Pontiac try to sell an entry level twin cam sport coupe with 155 horsepower and a standard five speed that was made in America. I am sorry I just don’t understand why this was a bad idea. 37mpg highway, 0-60 in about 8 seconds, cheap enough to buy your kid, made in America at a UAW plant by people making a living wage, not some third world hell hole. An ecotech engine good for 200k with by the book maintenance. Some times I don’t think we see a good deal when one is presented. Our loss. I guess the problem was that it was not much different from the Chevy version. Furthermore, in SS form, the Chevy had a more potent engine. In addition, it came in only one body style unlike the Chevy version when 2 door models were not selling as strongly as 4 doors. Plus, I would expect the base Chevy version to have a lower price point. It may have done better if the Chevy Cobalt did not exist. The G5 wasn’t necessarily a “bad idea” but it was about THE weakest possible attempt to produce a small car for Pontiac dealers. The grille for a G5 could be slapped on to a Cobalt with all the effort of a 12 year old….girl. The tail lights are nearly the same as the Cobalt’s, with the backup lights moved to the bumper. 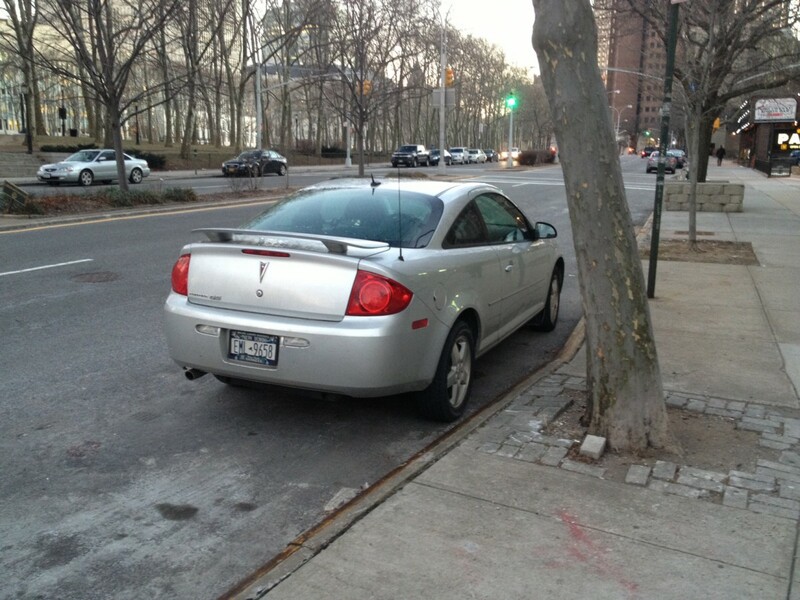 The G3 is even less an effort to differentiate a Pontiac from a Chevy….if that’s possible. With Chevy building highish performance Cobalt 2 doors, Pontiac should have gone the “other way” and built a junior G8 using the 4 door sedan body and the Cobalt SS engines. And really, how hard/how much imagination would have been involved in just tooling up slightly different tail light lenses? No, the weakest was the 80’s Pontiac T1000, based on the Chevette. I knew peers in school that really thought their T was ‘better than a Chevette’ and some who didnt think it was the same car. The idea of one isn’t bad, the execution was. I don’t even recall Pontiac even attempting to market the G5 when it was around, which certainly did not help things. Personally, I rather liked the looks of the Cobalt/G5 coupes, but two things really stood out to me regarding these cars versus their peers. The first was the interior materials; most of what you saw and touch just felt brittle and cheap. The second was the rear seat space (or complete lack thereof). Specs don’t portray this properly; on paper they may be competitive, but in the real world, my legs just don’t fit in the back of these at 6’1″. I can fit in the era Civic coupe, and literally stretch out in a Scion tC. The problem was that you purchase could a small, affordable sport coupe with all of those features at your friendly, local Chevrolet dealer. GM had been – correctly – lambasted for watering down the images of its various divisions over the past few decades with too many “badge engineered” vehicles, particularly in the subcompact segment. Given GM’s repeated promises do better in that regard, this car came across as an exercise in corporate cynicism. There was nothing wrong with the concept of an affordable, sporty compact Pontiac. It just needed to be a definite step above any Chevrolet entry in that segment. This car clearly was not. GM , threw Pontiac into the ash bin with all those stupid “g” vehicles. It made no sense then , still doesn’t. Bob Lutz , for all his glory, can gloss over all of GM’s fatal errors while he was there and talk about what was going to happen and never did. GM , threw Pontiac into the ash bin with all those stupid “g” vehicles. It made no sense then , still doesn’t. I don’t know about all that, The G6 was a nice car and the G6 convertible was a nice touch. Not many companies have made hard top convertibles and non were sold as cheap as the G6 when new. It’s frustrating because I like smallish sporty coupes, so this is the sort of car I would have considered actually buying, but it loses me before I even sit in it. It was when cars like this came out that I began wondering if Pontiac would go the same way as Oldsmobile. Of course, the G8 led to some cognitive dissonance, but then they released the G3. As you convey, the G5 was just a lazy effort. The G6, on the other hand, was a nice effort, and I’ve always commended GM for giving Pontiac coupe and convertible variants, even if they didn’t sell too well. My mom and I actually rented a G6 sedan from Enterprise in 2008 when we were attending a family friend’s wedding in Virginia Beach. We were actually the very first renters; the car only had something like 20 miles on it and still had dealer tags. For what it was, I was actually impressed. I didn’t have my license at that point, but mom said it handled well. Interior was predictably cheapy in materials, but it was assembled solidly. That being said, I’m sorry to say I don’t really miss Pontiac. While many people who have stronger ties to Pontiac’s performance past still lament over its discontinuation (especially in the name of saving Buick), I personally never really held Pontiac to high regards in my mind. To me they were always just rebadged Chevys or Oldsmobiles, with homelier styling inside and out. Were it not for the division’s high sales in the 1990s (they actually outsold Chevy one year), largely thanks to the Grand Am and Sunfire (both rebadged cars), I think Pontiac would’ve died sooner. The G6 did feel unusually “solid” when it was new, despite lots of seemingly cheap materials. Maybe it was just low expectations. I rode in a rental when it was new (wasn’t old enough to drive it), and there was none of the tinniness of the N-Body when closing the doors or going over bumps. I have a 2009 G6 Sport Sedan. Bought new in 2009 (right before my company folded…. Yay!) with the 2.4 Ecotec and the Korean six speed autobox. Think of it as a G6 GT, but with an Ecotec. Six years in and 96,000 miles later, it’s a typical rattle trap Pontiac. Lots of small rattles and buzzes, but no major problems with the interior. With the exception of a less than durable grade of leather and a lot of black plastic. The acres of black plastic reminds me of the early 1980’s BMW 3 series, actually. The power door lock in the right rear quit a couple of years ago and I had the usual issues with the intermediate steering shaft and the Ecotec exhaust and intake sensors. Three weird things happened to it recently, though. This past spring the right rear brake caliper gave up the ghost, leaking brake fluid all over the place. And in the last month or so, the driver’s side seat heater quit working along with the power raise up and down portion of the power seat controls. I will have to figure that out before the snow flies. Six years in, I still like the car, but I’ve almost always had older used cars, so squeaks and rattles don’t bother me much. Drives my wife nuts. The car has been reliable and gets good mileage in town and the freeway. It has a good suspension, rather good four wheel disc brakes and now that I have a nice set of Kumhos on it, I can really tear up the corners. Sometimes I wish I had paid for the V6 model, but I bought this car right after we had experience $4.35/gallon gasoline in this part of Michigan. In that regard, it was still the smart choice. I don’t think that GM’s choose Buick over Pontiac, but the choice was too dump both rather than one or the other. Keeping Buick was more to keep the China market happy. The basic model seems to be basic cars and a luxury division (Toyota-Lexus, Honda-Acura, Nissan-Infinity). However this does not work if one looks at European cars where Mercedes, BMW and Audi are broad range cars. Audi is part of VW, along with Bentley, so things are more complicated in Europe. For the US market though, Buick does not add much to what Chevrolet offers. Cadillac, on the other hand, has a line up not copied at Chevrolet (except the XTS and Escalade). According to Bob Lutz, part of the bailout proceedings also dictated that Pontiac be dumped. The Feds originally just wanted Chevrolet and Cadillac to be kept, but GM was able to make a strong enough case for Buick (Chinese market) and GMC (loyal truck buyers), but couldn’t do the same for Pontiac, as it hadn’t been profitable for some time (despite strong sales, a good portion were loss leaders). Lutz is also quoted in saying that plans for the next generation G6 were to have it go RWD, using the ATS’s platform. Now that certainly would’ve got my attention. 1. Pontiac was terminated at the end of 2010. So at best Pontiac would have little to sell for a couple of years. The Pontiac G8 is now a Chevrolet model. If there is a good case for a lower end ATS, Chevrolet could market one. As it is Cadillac is having some difficulty selling them. As far as the bailout goes, GM really did not need Saturn, Hummer or all of the mid range makes (Pontiac, Oldsmobile and Buick). I think the Government demand for restructuring was reasonable, but I also think Lutz is pointing the finger at the Government when really GM made the decision. The 2016 Camaro is based on the ATS and is going to be more expensive than this years model. So I am not sure that a Pontiac ATS makes any sense. An ATS-based Pontiac G6 would be interesting, though I agree it wouldn’t have made a whole lot of sense, as there really isn’t a market for small, non-premium RWD sedans, especially when larger ones like the Dodge Charger are reasonably affordable. And I was just using that interview as reference, I don’t agree with most of what Bob Lutz has to say about anything. Lutz is no doubt pointing his middle finger at the government. He goes into further detail about this in his autobiography, which I read the beginning chapters of, basically saying the fact that they actually bailed out GM in any form is the only act he supports. I think the basic point is that in the short run Pontiac probably was a liability not an asset. In the longer run Pontiac might have been remade into something of an asset. The ATS platform is expensive and while a Pontiac version might have been interesting, I don’t think it would have been cheap enough. I also doubt that Cadillac would have liked the competition. Have you looked at the ATS? The ATS is a solid effort by GM to compete with the Germans, but it doesn’t appeal to me personally. It’s priced pretty much in line with the 3-Series, including the fact that every option is another grand here and there, adding up quickly. I’d much rather have a 3-Series, especially if the Cadillac is no cheaper. This is Cadillac’s basic problem, most people will want the European car before the Cadillac. For me Cadillacs are available locally while the import luxury brands are 350 miles away. More often than not, I doubt that Pontiac would even have an ATS given the notoriety that GM would probably produce the cheaper FWD platform of the Chevrolet Cruze instead in its place since the ATS unrelated to both the Cruze and Verano were all identical in size anyway. Pontiac with RWD cars today, would be overlapping Chevy Camaro and Vette, along with Cadillac. Seen the sales stats of ATS? CTS? Chevy SS? Really think BMW owners would buy a RWD G6 now?? Older GTO fans would hate the modern styling as they did with the Holden GTO. GM would be resorting to Pontiac badged SUV’s, like the Buick Encore, for sales. I thought that the entire bailout/bankruptcy had delayed the debut of the ATS for a few years. Buick has always been a sacred cow in that the entire corporation was built around it. Durant used Buick as collateral to start GM. I think he lost sight of what he started out to do and lost control of GM. The Bankers sort of cleaned up the mess. Then Durant took over Chevrolet and, using Chevy, got control of GM again. Durant was not good at management and lost control again. Now Chevrolet is part of GM but there is another mess to clean up. Sloan does manage to make Chevrolet the low end, with Cadillac at the top end. But he never really gets the midrange sorted out. To me the midrange could have had Pontiac’s range from Chevrolet to the low end of Oldsmobile. Then Oldsmobile is from the upper end of Pontiac to the low/middle of Buick. Buick would then range from the upper end of Olds to the bottom of Cadillac. But Buick generally ranged from the lower end Pontiac to well under Cadillac, but usually above the top end of Oldsmobile. I see zero problems with this. Did he really think they were going to give GM $60 billion to make the same mistakes over again that drove them into the ground? Lutz is definitely bit conceited and hot-headed, to say the least. I rented a G6 about 5 or 6 years ago and was initially impressed by it. Yes, it was well built, or at least seemed to be. (I got mine through Enterprise as well, but it had a few thousand miles on it.) Unfortunately, a few of the small details were a bit baffling to this driver of numerous Japanese sedans. It took a few attempts to get the in-car entertainment system to work. But the real head-scratchers were lights and wipers. Did/does anyone at GM ever drive a non GM vehicle? Every Japanese cars (seems to) have very logical controls…..GM? Not really. And yes, I was amazed that Pontiac got a G6 convertible with a folding metal top and didn’t have to share it. I find the comment about the lights and wipers rather odd. Any company’s entertainment system can be a bit confusing, but all G6’s had the (now) standard of the left stalk controlling all of the lights and the right stalk controlling all of the wiper functions. The car has the (nearly) standard three dials for climate control, (and per European practice) a nice big hazard light button nearly in the middle of the dash. We had a G6 rental, iirc it was a GT model, and found it to be solidly built and a decent-handling car. Maybe if the Cobalt had been sedan-only and the coupe exclusive to Pontiac? Really, though, Pontiac already had a very good – and well differentiated – compact offering in the Vibe, so I always thought of the G5 as a sop to buyers who didn’t want a hatch/wagon/four-door. I never understood the aversion to versatility. The G3 was a last-second response to the spike in gas prices that started in 2006 and peaked in ’08 just before the wheels fell off the economy, or at least its’ presence in the US is. It had been offered in Canada all along and was the last in a long line of cheap bottom-feeder minimally differentiated Cheviacs up there. Yup, we always had the availability of the Pontiac G5 sedan. Also when you guys lost the 4 door sunfire after the 2002 model year, We’ve always had 4 door versions up here. Short term planning at the expense of long term viability, GM’s playbook for years. 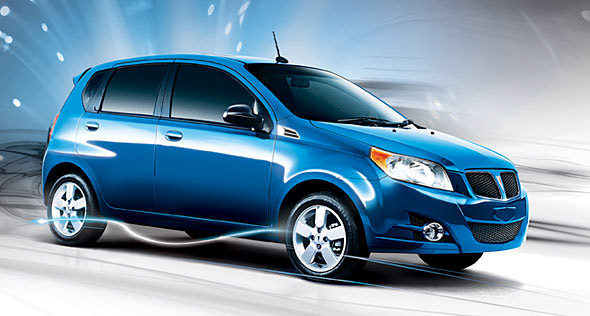 Pontiac: We Build Excitement [ spelled Aveo in Korean ]. Seconding that. My 2007 Cobalt with a 5 speed was rapidly approaching lemonhood when I traded it at 3 years. The steering shaft failed, yes failed, at 8,000 miles. Clutch started chattering at 15,000. Intermittent gremlins took residence in the radio at about that time. The infamous black plastic outside trim was faded and chalky. It wasn’t fun to drive either. Understeer and balking at every curve like a depressed mule. Tonka level plastic interior. In it’s defense, the brakes and power delivery were okay. Mileage was good. The GM A/C was it’s usual strong self. I’d thought perhaps if I babied it and took special pains to not abuse that it would be reliable. Drove like an old man over bumps and no full throttle at every stop light. Revelations of tap-dancing on landmine status by owners with higher mileage and noting of similar trends with mine did however make this one special car for me. How? This is the car that made me swear off GM forever. Yet another Deadly Sin candidate. While some versions of the Cobalt SS deserve respect, this G5 was a sad joke. The lazy grille design especially looks tacky – was anyone fooled? I wasn’t even aware the G3 existed. All the G# nomenclature scheme did was make all of them forgettable. The G# being forgettable is ominous for Cadillac who is moving to a CT# series naming scheme. The current #TS scheme is hardly better though. Pontiac G-what????? I had lost interest in Pontiac after owning a 1984 6000 wagon in the mid 90s. Dad had one too. Dad’s had high mileage but ran ok; mine was a piece of junk. Hated the orange instruments because they hurt my eyes at night. By the time these G-cars came out I was completely indifferent. Friend had a 2005 Cobalt and said it was the worst car ever, he was happy to get rid of it and replace it with a 2002 Focus. I imagine the Pontiac version was no better. Pontiac had a lot of heritage built up over the years with nameplates like Lemans, Bonneville, Pariesienne, Phoenix, Safari etc. that they could have drawn on. They at least had that if not quality product. They threw that all away in the 2000s. The problem of rationalizing too many brands dates way back to the 1950’s. The dealers always seemed to get their way at the expense of logical product planning and placement. The lure of extra volume, even at lower margin, seems to win out. The problem for many, especially rural, non-Chevy GM dealers was how to make more money, with the strong temptation to go down-market in order to do volume, even at the expense of the local Chevy store. Hence, we have to have cheap Pontiacs on the lot. The GM system was long obsolete anyway. Olds was stuck right in the middle and couldnt survive as a niche brand, but there was enough room for Pontiac to be performance, like Dodge, its traditional Mopar competitor, and Buick, near luxury, like Chrysler in the Mopar pecking order. I totally agree that GM stretched too thin. Pontiac was on the chopping block in the mid 50’s, until Bunkie and DeLorean stepped in. Before “Wide-Track” and Tri-Power, brand was a ‘little old lady’ make. After the muscle car era faded, Pontiac tried to be both Chevy and Olds/Buick. With Chevy powered Firebirds, Chevette clones, and Olds look alike 6000. Then in 90s/2000’s the body cladding became a huge joke on Grand Ams, then the G6 was plain as vanilla, overlapping Malibu. The trunk/boot lid and door handles if not the entire thing looks to have been restyled out of a Opel/Vauxhall/Holden VECTRA, a rebadging effort worthy of BMC or Rootes group. The then-current Astra, Cobalt and G5 were all based off of the GM Delta chassis. I wouldn’t doubt there was some interior hardware sharing, though. Yes the Astra also wore every badge in the GM universe nobody notices untill two different badges show up in the same market. I agree with some of the people above that the G this and that was a stupid deathrow type strategy. Remember when Audi had it’s near death experience and fooled with their numbering system twice in a decade. Now Cadillac is doing it again because few people want fake BMWs from them. I can’t think of a time when it was a sign of success. Cadillac’s sport sedans (ATS and CTS) are quite good cars, but not your grandfather’s de Ville. I think the problem with the third (current) generation CTS is that it should have been labeled an STS. I don’t think the new series numbering scheme is better, but then I would not want to call the ATS a Cimarron or the CTS a Catera (which is what they actually replace). In the good old days (before the war) Cadillac used a number of numbering systems for their series names. For example in 1930 the V8 was a series 353, the V16 a series 452. I wonder what someone schooled in social psychology would have to say about GM’s behavior over the past 2-3 decades. I think I would like to read that. Also wonder what the current occupants of the Renn Cen have to say about it behind closed doors. Being a Pontiac fan, I like the G5. By the same token, I was rather p!ssed there wasn’t a supercharged/turbocharged version like the Cobalt SS. The reality of it all was, Lutz was trying to reposition the brand and cars like this weren’t really adding to that effort. I think the idea was to get to a highly truncated lineup, i.e., G6, G8 and Solstice. Clearly it was never going to happen. I can remember talking with a long time Pontiac salesman after the closing was announced. Their shop was going to be Buick-GMC only and he was concerned about what they would do for entry-level cars. I thought to myself well, they (GM) want you to move upwards, do it. In the interim, they *did* get the Verano, so I guess that answered that question. The Gx naming strategy actually had a logic behind it. The G5 was the fifth generation of the GM J-body subcompact car. The G6 was the sixth generation Grand Am. The G8 was the eighth generation Grand Prix. Yes, the G3 really was the third generation Aveo. I thought the styling of the G5 was better than the Cobalt, and the option packages were better. OTOH, had the G5 had the sedan model and a GXP level package, it would have been more of the same cannibalism that GM (and other marques) that had been going on for a while. G3 (Wave) and Aveo: were badge engineered korean Daewoo Gentra. The model is still in production by the ukrainian “Zaz” car factory as Zaz Vida… They are also doing some body modifications into pick-up/van etc. IIRC the ONLY reason G5 and G3 ever existed in the States was Pontiac dealer’s “me too” demands. The dealers did it to themselves. Some car fans go on about how bad it was that Pontiac was dropped. But it was not as if they were still selling 1967 GTO’s and Firebirds with actaul Pontiac V8’s in 2009. The G8 wasn’t bringing in enough buyers to keep it profitable. G6’s sold with huge rebates, and the G5 was another loss leader, for low credit score buyers. A Pontiac dealer on Chicago’s South Side [Roseland] was #1 in sales of Sunfires and demanded the G5. Needless to say, they are defunct too. Car makes can’t survive on just “memories” … and low credit scores. I’d say that, by 2005, both Chevrolet and Ford had more of a performance image than Pontiac. Pontiac’s “performance years” were roughly from 1959 through 1971. By 2005, hardly any car buyers under the age of 45 remembered Pontiac’s “Golden Era,” let alone considered it relevant to their choice of a vehicle in the 21st century. I know where that G8 is parked. 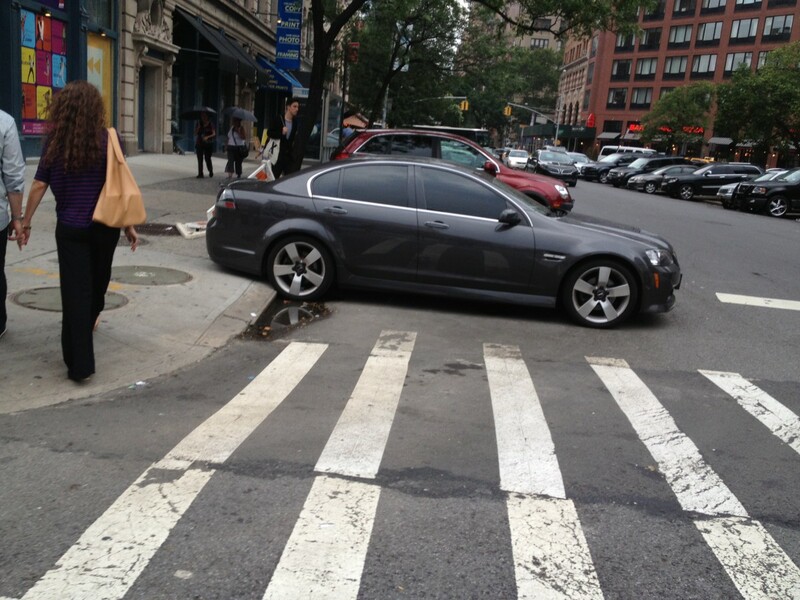 It’s on Canal Street and 6th Avenue, not far from a Maserati dealership. I bet the G8 is owned by a cop. I know it was just another silly GM rebadge, but if I was on a budget and wanted a descent looking compact, I might have given the G5 a look. It was actually a handsome little ride in comparison to its American cousins, the dead-on-the-vine Neon, and the Focus which was getting a bit tired by 2005.